A few things in the works. Writing, Teaching and Acting. Writing-wise, I’m deep in a second draft of the second novel. Gratefully, I have received some funding to work on all of the current writing projects on my desk: the novel, a collection of essays and a young adult novel. Teaching-wise, I’m teaching Screenwriting II at UT SCS and leading one Writers’ Circle TO session so I can concentrate on writing & performance. Those sessions are so so inspiring with everyone firing on all pistons on all sorts of creative writing projects. Please do inquire, if interested. 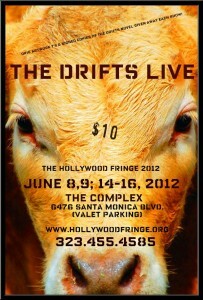 The Drifts Live has convinced me that I’m ready to re-enter my work as a professional actor. I’m now represented by Penny Noble at Noble Caplan Abrams and getting my feet wet going on interviews. FYI, the Writers’ Circle TO are weekly workshops (8 per session) where, by invitation only, creative writers writing in every medium (screenwriters, fiction, literary non-fiction, memoir, performance, drama, etc.) gather to read and workshop each others’ work. Each week, will focus on a different aspect of creative writing: character, setting, voice, tone, rhythm, rewriting, social media and so on. Additionally, we are developing The Drifts Live into an international touring product with accompanying creative and critical workshops. Shall we visit you or your organization? 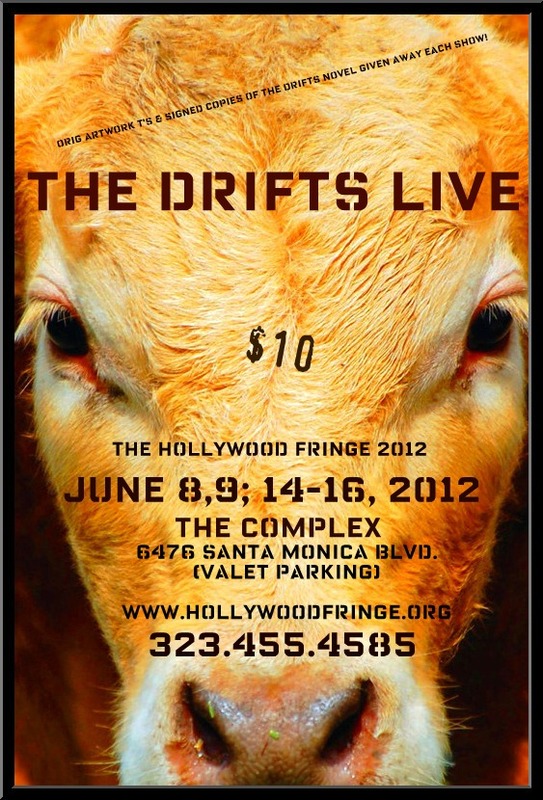 The Drifts Live Hollywood Fringe 2012 from thom vernon on Vimeo. 2012 started out with a bang! March sees publication of my chapter outlining the connection between creative writing and the public good. You can find, “Selling It: Creative Writing & The Public Good” in The Creativity Market: Creative Writing in the 21st Century (Multilingual Matters, 2012), edited by Dominique Hecq. April will see me (finally!) in Arkansas smack-dab where The Drifts takes place. 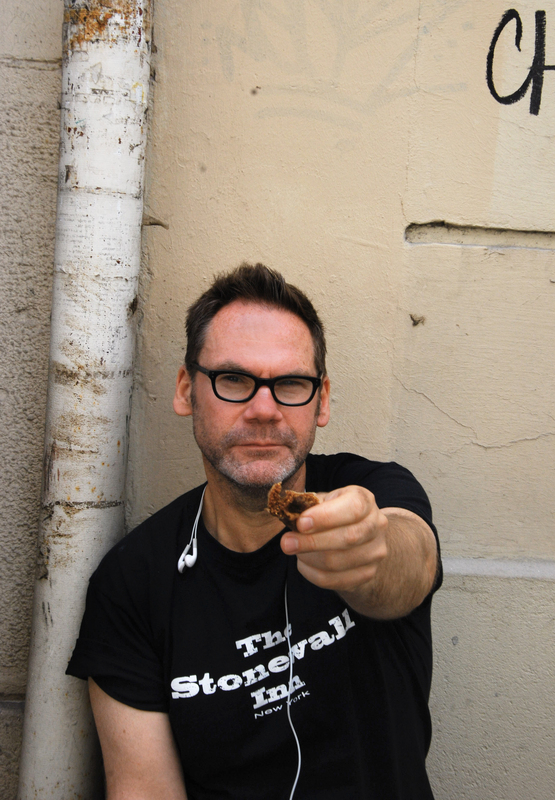 First, I’ll be the guest of the Arkansas State Literary Festival in Little Rock. Come on by! I’ll be reading, offering my two cents on panels and leading a very cool, “Local Color” creative writing workshop full of secrets and the hidden hidden. Not to mention—a teeny bit about publishing. After the Fest, I head over to Jonesboro, about an hour west of Memphis, to the Delta Symposium and Arkansas State University-Jonesboro where I’ll read, sign and do a couple workshops. One the ‘Local Color’ from the Fest but also an interactive, interdisciplinary workshop on Gender & Sexual I.D.s for the Women’s Studies Department. I’m very honoured to have been invited to offer a key-note to the campus and surrounding communities on how gender, history and memory collude at the local. That particular them is so key to my writing and overall work. In May, I’ll offer a presentation on Creative Writing and the Public Good at the 2012 Canadian Creative Writers and Writing Programs (CCWWP) Conference at Humber College in Toronto. Then, as I have moved from the active promotion of The Drifts book, I am in rehearsal and pre-production for a staged version of excerpts from the book. I will be doing 5 shows at The Complex in Hollywood, CA June 8-9 (previews) and June 14-16 (peformances) as part of The Hollywood Fringe. Here’s a link to our Kickstarter campaign where you can support this exciting project and earn rewards. See the video below! Vajdon has done original line-drawings of the book’s cover which we’ll make into a one-of-a-kind way that you can support our efforts (plus quite a few other goodies!). Plus, as promised, the workshops are starting to line up! How about your group or organization? You can learn about screenwriting courses that I currently teach at the University of Toronto School of Continuing Studies here. 2012 also sees me finishing up another literary novel and seeking representation for a murder mystery/suspense novel, Buried Hearts, in which Jocelyn Sloan, a Chicago homicide detective is forced to dig into the suspicious death of her parents while confronting the killer who she has, unwittingly, inspired. Also this year will see the publication of two scholarly chapters. The Angel at Our Table: Brooding, Benjamin and the Art of Melancholy to be published shortly in Food and Art (Cambridge Scholars’ Press,UK, 2012); and Selling It: Creative Writing, Neo-liberalism and the Public Good in The Creativity Market: Trendsin Creative Writing in the 21st Century (Multilingual Matters: New Writing Series, 2012).The first articulates the critical origins of The Drifts while the second tracks the role that creative writing has in the public good. I will be presenting on creative writing and the public good at the Canadian Creative Writers and Writing Programs (CCWWP) conference in May here in Toronto. Just before that, in April, I have been invited to read, panel and lead workshops at the Arkansas Literary Festival in Little Rock. Sometime in May I will go to Thailand to act in a German film playing “The Australian” for the Berlin director, Susanna Salonen. Lastly, I will (fingers crossed) receive my TESOL certification in May or June so that I can teach English anywhere in the world. There are two novels in the works and one on the back burner. The first is a literary novel based in Toronto, while the second is a mystery/suspense, Buried Hearts. Stay tuned for more news on those as they come. You can read my Huffington Post articles and/or connect with me at Facebook/thedrifts page or follow me at twitter.com/thomvernon.